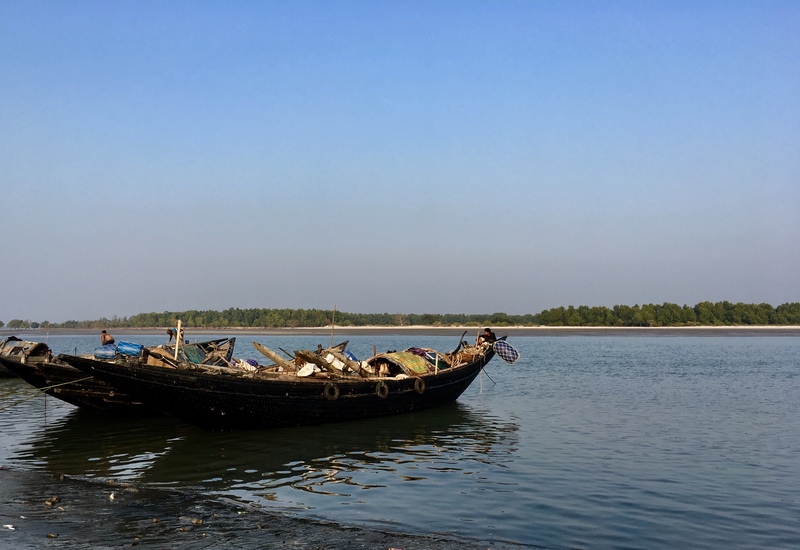 Dublar Char (Dubla’s Island) is a remote fishing island perched on the very edge of the Sunderbans, at the mouth of the Ganges delta where several mighty rivers empty into the Bay of Bengal. 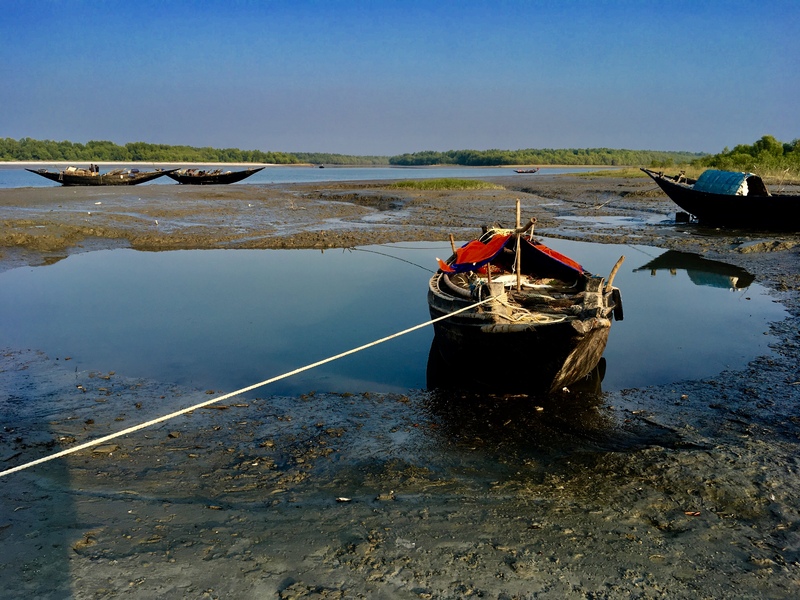 The island, though difficult to reach, is a renowned fishing hub and famous for hosting the annual Rash Mela (Rash Festival), attracting thousands of Hindu pilgrims to its shores. On a recent visit, I was spellbound by its beauty and amazed by the local fauna – a photographer’s dream, as the island is home to a variety of birds and giant sea turtles. 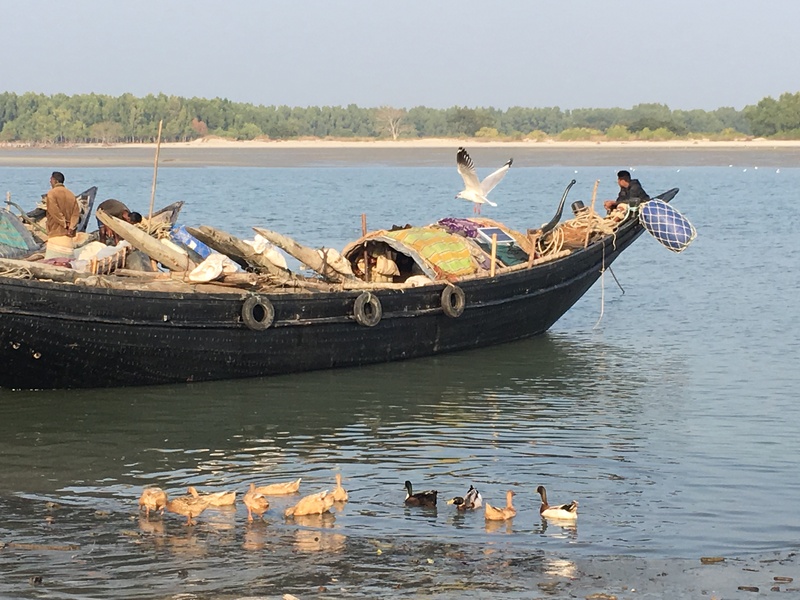 I was also left intrigued by the nomadic fishing community who return every year to Dublar Char, leaving behind the comforts of their homes to eke out an existence. The vast expanse of the Poshur River stretched out across the horizon, its turbid waters roiling behind our small boat. The monotonous vista of river and sky was suddenly rent by a retinue of giant cargo ships, heralding our entry into the bay. Rickety old fishing boats crossed our path as we neared our destination. A boat approached us, bobbing up and down in the swell as it pulled up alongside our vessel. Weathered by the elements, the dark, stoic face of a fisherman peered up, offering to sell us freshly caught pomfret. Within moments another boat eased next to our boat, offering to ferry us to the island for a small fee. There were no docks on the island and our boat was too large to navigate its way to land. A flock of traditional fishing boats lay anchored on the beach. Beyond them, a sea of people stood on the shore, silhouetted against the afternoon sun. They were local fishermen, having returned after a hard day’s work with their daily catch. They thronged the beaches in the late afternoon, passing time and watching the rare boatload of tourists disembark on the island. Dublar Char, only habitable in winter, offers a seasonal base for fishermen in the area. 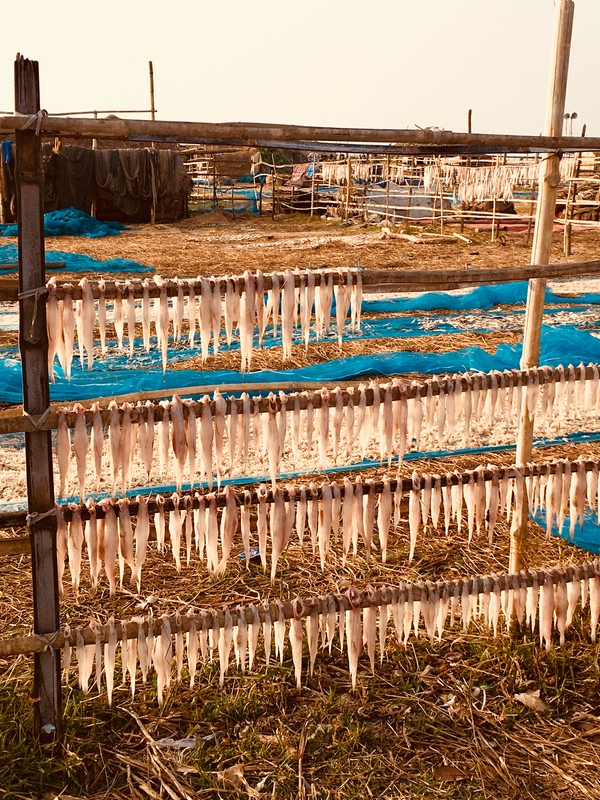 Every year, between October and March, thousands of fishermen descend on the island, setting up temporary structures that double as their sleeping quarters as well as fish processing centres. 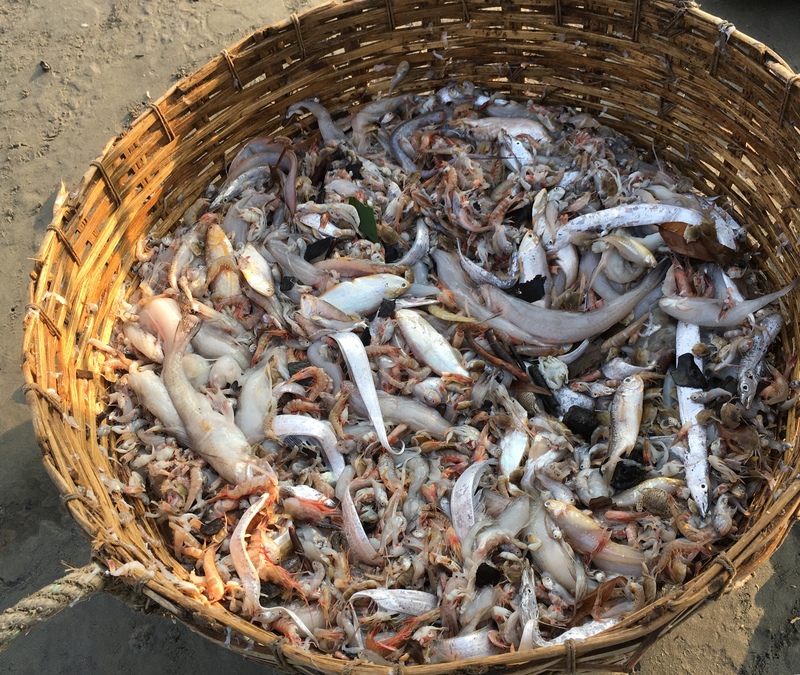 While most endure the perils of deep sea fishing, others tackle the backbreaking work that goes into shutki(dried fish), processing. 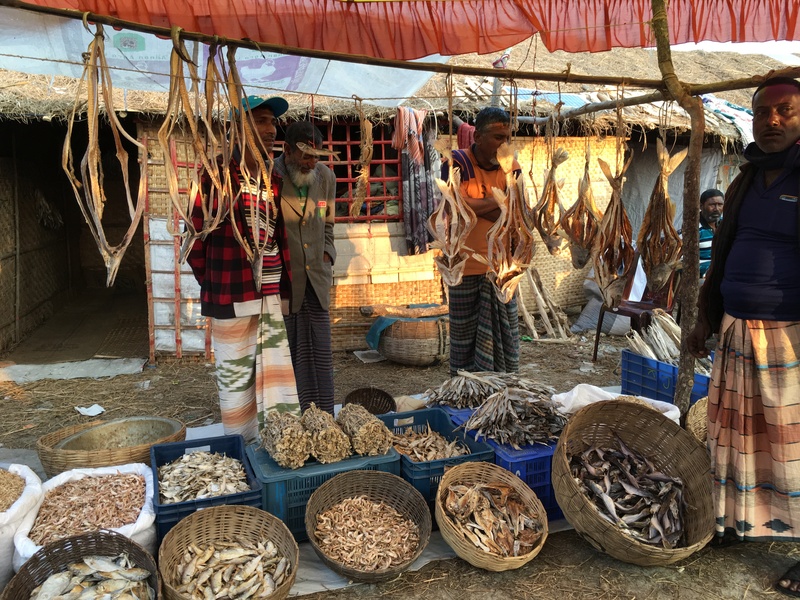 The island is one of the largest dried fish processing centres in Bangladesh, producing much of the shutki that is exported to neighbouring countries. Entering the fish processing enclave, the picturesque views of colourful fishing boats quickly gave way to miles upon miles of bright blue plastic sheeting, upon which thousands of silvery fish were laid out to dry in the sun. I was surrounded by rows of makeshift bamboo fencing, across which even more fish were strung out to dry. 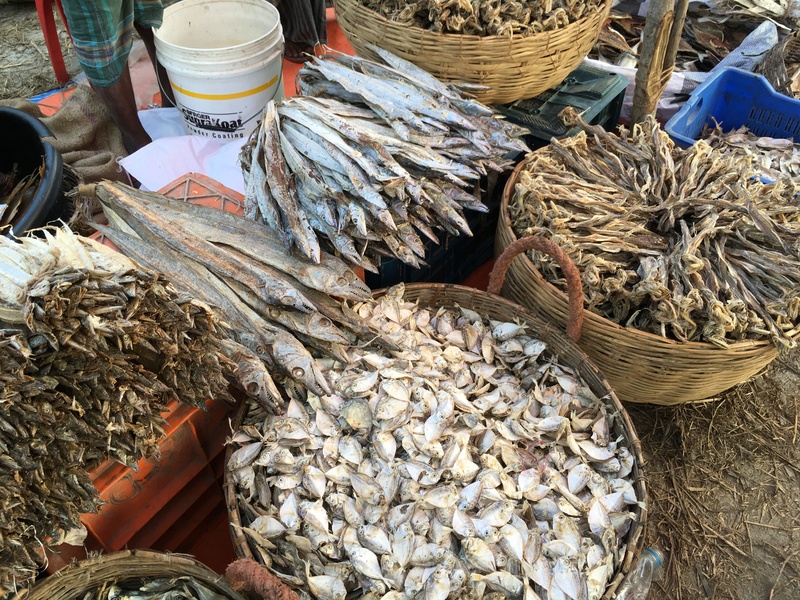 Steering a course through a maze of fish and sand dunes I emerged onto a small market square. Bordered by thatched-roofed huts, the open-air market was abuzz with activity. Hessian sacks heaped high with shutki were spread out on the sandy floor, while an assortment of the biggest and most prized dried fish hung from the rafters. A small collection of plastic chairs and tables lay haphazardly in front of a handful tea stalls, serving up local delicacies. I tucked into generous helpings of piping hot shingara (fried dough with a savoury filling), honey drizzled sweets and gurer cha (tea with molasses). I was joined by Oli Mia, a local fisherman, who had left his family behind on the mainland for the season. Over tea he regaled me with tales of swimming with dolphins and watching gigantic whales surface near his boat. Fishing was ruthless and dangerous work, often with little pay, and Oli Mia supplemented his income by offering to take tourists out on his boat on dolphin and whale watching excursions. Dublar Char presented fascinating insights into a unique way of life, an unexpected gem often overlooked in this part of the country.